It's been ages since I partied with the ladies over at Humbug Hall and I thought I should remedy that:) The theme this week is white on white which is odd when you get together everything you think is white and find it's all different shades of white! Such a beautiful white on white card, Valerie. I love all the super embossing! You are so right about the different shades of white - I ended up cutting up one of my base cards to use so that everything would match. 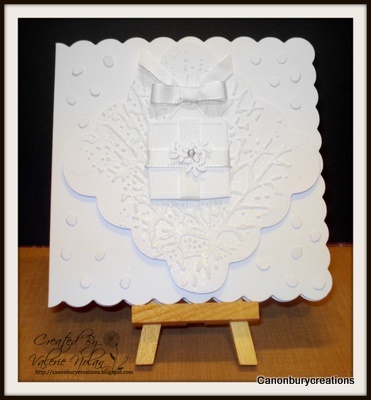 Lovely effect here - bet you're glad Karen made you get that embossing folder now!! Aren't you glad I "made" you buy these embossing folders Val!!! lol Lovely card - WOW looks so elegant. oh how gorgeous is this - soooooooooooo elegant and just beautiful. I love it. Thank you so much for sharing with us at Bah! Humbug! Stunning, love the parcel effect. A beautiful WOW card Valerie. Not an easy challenge - as you say, there are so many shades of white. Love the embossing and the little parcel tied with a bow.